Full professor of Fundamental Theology, Pontifical University of the Holy Cross, Rome. Formerly: CNR researcher in Radioastronomy, Bologna, and Astronomer at the Observatory of Turin. Editor in Chief of the Interdisciplinary Encyclopedia of Religion and Science ISSN: 2037-2329. Director of the “Faith and Reason” Section at "Veritatis Splendor" Institute, Bologna. Associate Professor of Philosophy of Science and Philosophy of Nature at the Facoltà Teologica dell’Emilia Romagna, Bologna and Associate Professor of Fundamental Theology at the Istituto Superiore di Scienze Religiose all'Apollinare, Rome. Formerly: Full Professor of Mathematical Physics at the University of Bari and C.I.R.A.M, Bologna. Co-editor in Chief of the Interdisciplinary Encyclopedia of Religion and Science ISSN: 2037-2329. Director Poggiolevante University College, Bari. Graduate in Physics, Degree in Canon Law. Formerly: ELIS Centre, Rome, Director, and Professor of Computer Science, University Campus Bio-Medico, Rome. Appointed Professor of Logic and Philosophy of Science and Executive Director of the Center for Research, Pontifical Antonianum University. Researcher and Assistant of the Director at the DISF Center. Editor of ESSSAT News & Reviews. Graduated in Philosophy, University of Rome "Tor Vergata", DISF Researcher and Editor. 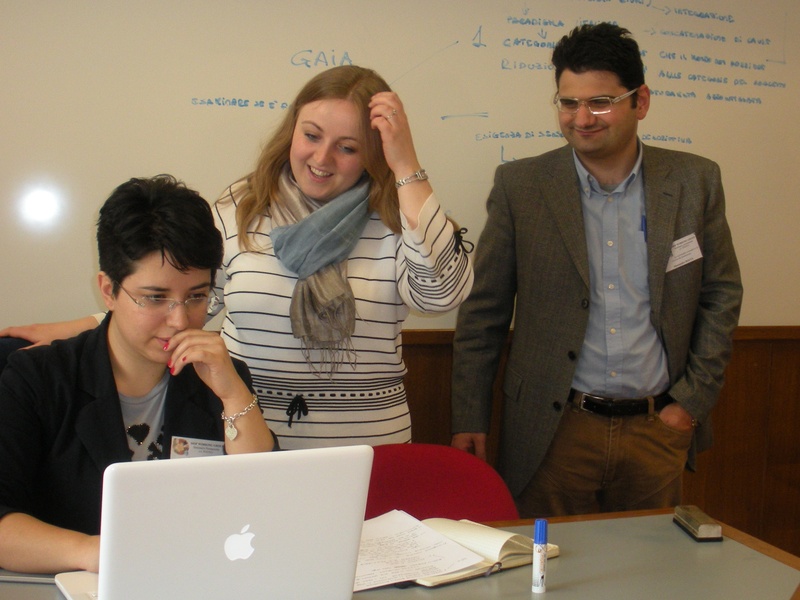 A number of young researchers who are members of the Advanced School for Interdisciplinary Research (ADSIR) work as authors and editors of most of the documents uploaded on this website. An editorial assistant based in Oxford (England, UK) is also collaborating on the Inters project. Physicist, CERN Research Senior Physicist, member of the Italian National Academy of Sciences and of the Academy of Sciences of Turin. He is the President of TERA Foundation, born to develop the modern radiotherapy technique for the treatment of cancer. Among many honors, he received the International Gold Medal of Merit for Catholic Culture. Presently he teaches Medical Physics at the University of Milano Bicocca. Full Professor of Astrophysics at the University of Padua. Since 1981 he has been the Director of the Ultraviolet International Explorer (IUE). From 1984 to 2003 he was a European (ESA) Project Scientist for the "Hubble Space Telescope" Project hosted by ESO (European Southern Observatory) in München, Germany. Electronic Engineer, Scientific Journalist, head of the Euresis Association. As a High School Physics and Math Teacher he carried out research on science teaching and learning. Since 1979 he has worked as a scientific journalist, collaborating with several newspapers, magazines and websites. Full Professor of Physiology, School of Medicine and Surgery, University of Turin. He is a member of the Rita Levi-Montalcini Institute and of the Italian Institute of Neurosciences. He has been a senior researcher at the University of Texas Medical Branch in Galveston. He is also a member of the Society for Neuroscience (SfN), of the American Association for the Advancement of Science (AAAS), and of the Alzheimer's Association International Society to Advance Alzheimer Research and Treatment (ISTAART). Philosopher and Essayist. In the field of culture, education and training he was a Member of CISEI - International Centre for Studies on Italian Emigration (2007-2012). Board Member of Genoa Science Festival (2006-2012). Mathematician and Essayist. Full Profossor of Numerical Analysis at the University of Rome Tor Vergata. He is one of the most important scholars of the history of mathematics, publishing books on the concept of Infinity, Number and Logos. and finally, the conviction that the relationship between science and religion should not stem from a renunciation to understand, as frequently happens when some choose fideism as the easy way out, but from an effort to know, trying to integrate that which is believed with that which is known.